Are almost all new Housing Benefit claimants in work? "A full 95% of new claimants between the period May 2010 to February 2011 are in work"
"More than 90 per cent of new housing benefit claims over the past two years have been made by employed people, as squeezed workers seek help with their living costs." "In-work households account for almost all (93 per cent) of the increase in the number of claimants in 2010 and 2011"
As part of Full Fact's series on Housing Benefit this week, we've explained what the possible cuts of £2 billion might look like [video] and why the claim that only one in eight claimants is out of work doesn't stand up to much scrutiny. But another prominent claim that has been circulating in comment pieces and Twitter feeds is that almost all new Housing Benefit claimants are in work. The Smith Institute, quoted by the Guardian this week, says 95 per cent of new claimants are in work. Inside Housing magazine earlier this year quoted a similar figure. But where do they get this figure from? As with the other factchecks we've published this week, data from the Department for Work and Pensions (DWP) is the source of the figures behind the claims. 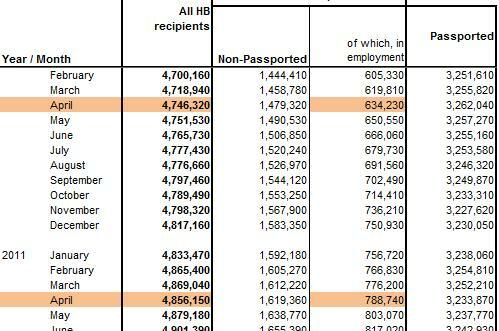 Table 6 of their complete dataset gives us information on the employment status of Housing Benefit claimants since November 2008. As we've discussed before, 'claimants' here aren't necessarily individuals, but can also be couples in the same household, who would be defined as 'benefit units'. The Smith Institute's 95 per cent figure comes from calculating how many more Housing Benefit claimants there are in February 2012 compared to April 2010 (their measure for 'since the General Election') - and comparing this to how many more 'in employment' claimants there are in the same time period. Between these two dates, the total number of Housing Benefit claimants has grown by 258,000. The number of claimants in employment has grown by 244,000. Hence the conclusion is that 95 per cent of new claimants are in work. Is this right? Unfortunately, we quickly run into a problem when trying to analyse the figures in this way. The total number of Housing Benefit claimants has risen between these dates by 110,000. Meanwhile, the total 'in employment' has risen by 155,000. 155,000 is 141 per cent of 110,000 - so the conclusion is that 141 per cent of new claimants are in work. This is, of course, a somewhat absurd conclusion. So what's gone wrong? The problem arises because these increases in claimants are not new claimants - they simply show a net increase in the number of claimants. Within this period many more people could have moved on and off the benefit, or had their employment status change. As an indicator, however, the figures show us that between April 2010 and February 2012 over 2.56 million new claimants were awarded Housing Benefit. In the same period, just over 2.32 million claimants stopped claimaing Housing Benefit. The data doesn't tell us what the employment status of these claimants is, however it does illustrate that increases in claimant numbers is not the number of new claimants to Housing Benefit but merely the net increase in claimants caused by large numbers entering and exiting the benefit over two years. 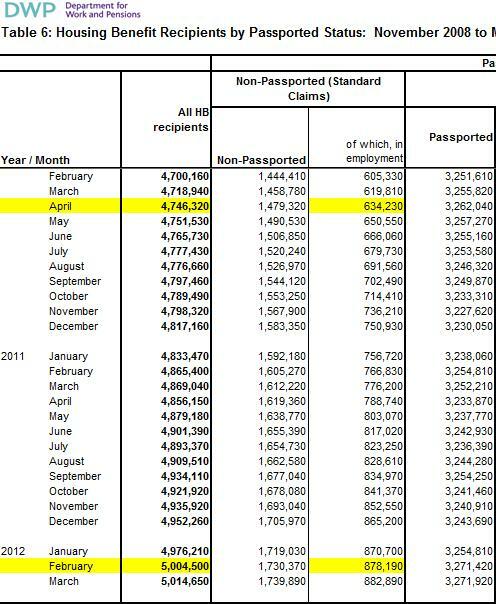 "Between January 2010 and December 2011 the number of "non-passported, in employment" claims (which are claims made by households in full or part-time employment) increased by 279,000 [compared to 301,000. This suggests that households in employment accounted for at least 93 per cent of the increase in overall Housing Benefit claimant numbers." This is a correct evaulation of the figures, although the phrasing can still come across as confusing. Households in employment, as we have shown, can on this measure account for more than 100 per cent of the increase - with decreases in potentially out-of-work claimants balancing out the rise. Whether the figure is stated as 93 or 95 per cent (depending on the time period involved), neither represents new claims, only the net increase in claims between two dates. This is why, in some timeframes, 'in-work' claimants can actually represent more than 100 per cent of the net increase. The Smith Institute, following discussions with Full Fact, have agreed to clarify their original claim in acknowledgement of this. Full Fact has also asked the Inside Housing magazine to make this clear as well. The Building and Social Housing Foundation (BSHF) have confirmed that the Department for Work and Pensions, with whom they have been in contact, have not criticised their own analysis arriving at the 93 per cent figure. They also pointed out that it is not unreasonable to infer from the available net increase information that a significant number of new claimants are likely to be in work. Full Fact does not dispute this and is happy to make this clear. Today's employment figures - what's the news? Is the Government's work experience scheme "getting Britain working"? How many people have never worked in their lives? How many working people are being forced onto Housing Benefit? Are only one in eight Housing Benefit claimants unemployed?